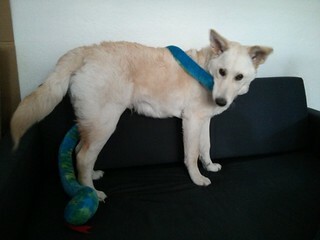 The giant plush snake is one toy that we actually went looking for. One of his first toys was a 9" plush snake and he just loved it. We thought if he loved the little one so much, chances are he would go nuts over a big one. We bought the largest one we could find, and it was surprisingly inexpensive. At 4 feet in length, it was just what the doctor ordered, or rather what I ordered from the doctors. Doctors Foster and Smith, that is. I think he really enjoys having such a large toy that he can drag around the house. It is long enough that we can wrap it around his neck and then watch him try to shake it off. It has a squeaker at both ends and a rattle at the tail end. The entire outside of the snake is soft, so it doesn’t make any noticeable noise when being pulled across the hardwood floor. Balki loves the toys with the most noise, especially after 9 o’clock in the evening. The giant snake is noisy enough to get him interested, but quiet enough that we don’t have to take it away when it gets too late. This isn’t a very durable toy, but fortunately Balki isn’t a fast destroyer. It exceeded all of our expectations.